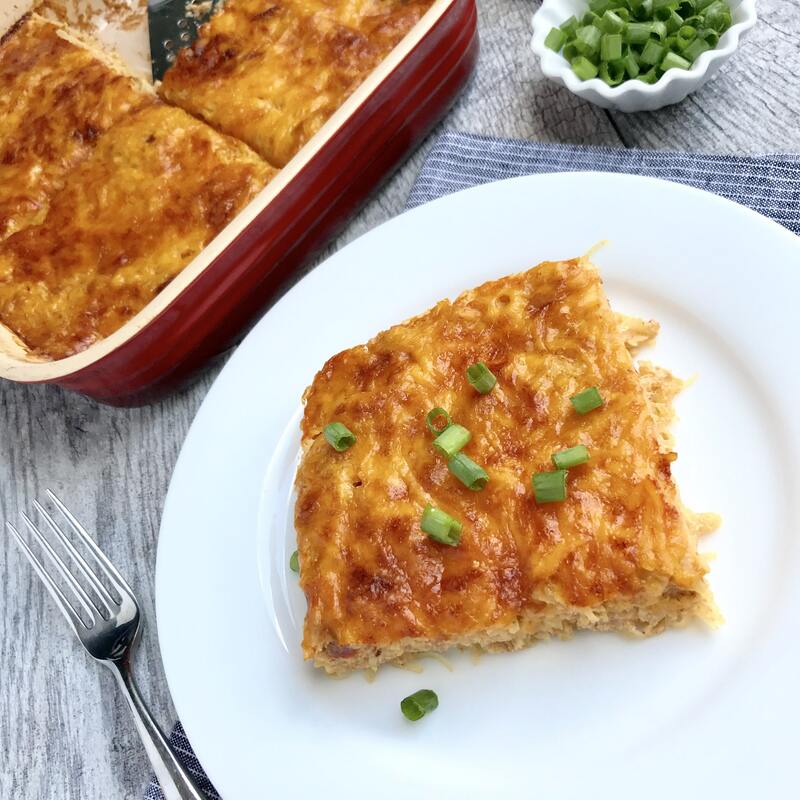 If you follow me on Instagram, you might have already seen this recipe – actually, probably more than once because I’m seriously loving it lately. It’s so easy to make, seriously delicious, and macro-friendly with 14 grams of protein per serving. I also love this recipe because you can whip it up ahead of time and then reheat it in the microwave for a quickie breakfast. I love topping it with fresh avocado or placing a piece between two slices of toast or an English muffin for a super satisfying breakfast sandwich. Holy yum! Feel free to select your favorite salsa and/or cheese varieties to personalize this recipe to your own taste preferences. 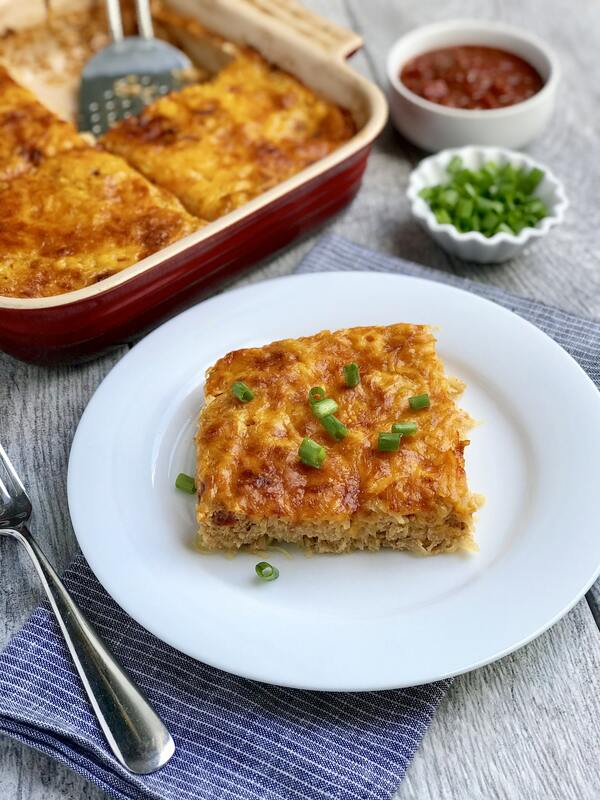 I actually tried a spicy harissa salsa in my most recent breakfast bake, which gave it quick the kick! 🙂 I hope you love this recipe as much as I do. I have a feeling it’ll become part of your regular breakfast (and maybe dinner) rotation! Combine spaghetti squash strands, salsa, and eggs in a large mixing bowl until well combined. Coat a square baking dish with non-stick cooking spray and pour batter inside. Use a spatula to smooth/level the top. Sprinkled shredded cheese on top. Bake for 30-35 minutes until cooked through and cheese on top is lightly browned. Remove from oven and allow to cool slightly. Cut into 4 pieces and serve! Here ends my pre-written posts for this season. 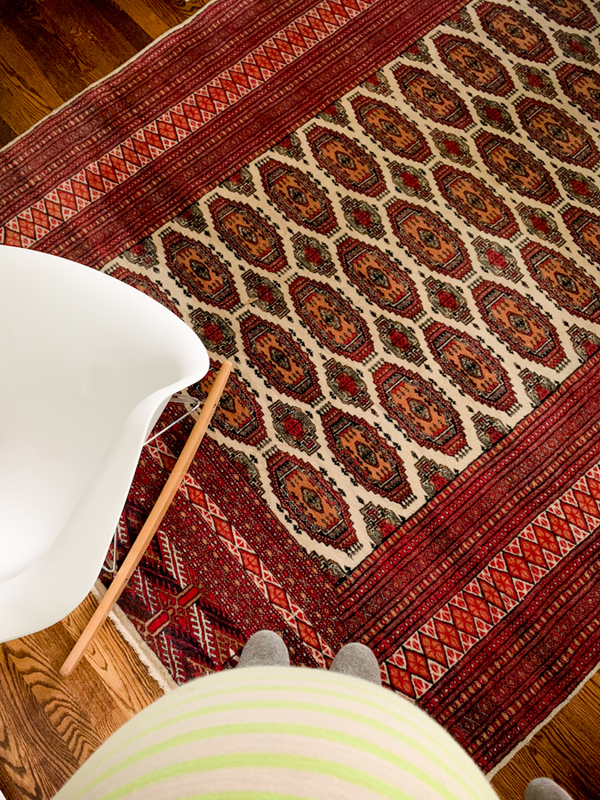 I’m planning to live blog until the baby comes! So it seems fitting that I end with a tour of our nursery. He probably won’t sleep in here for a while. Our plan is for him to sleep upstairs with us in the master for many months. Maybe 6 months? Maybe a year? We’re not really sure. 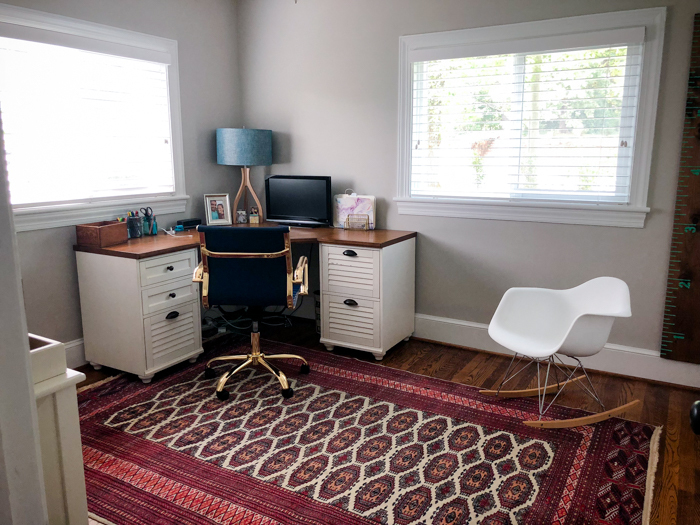 So while the nursery is “done,” it is more for daytime diaper changes, storage, and future use for now. 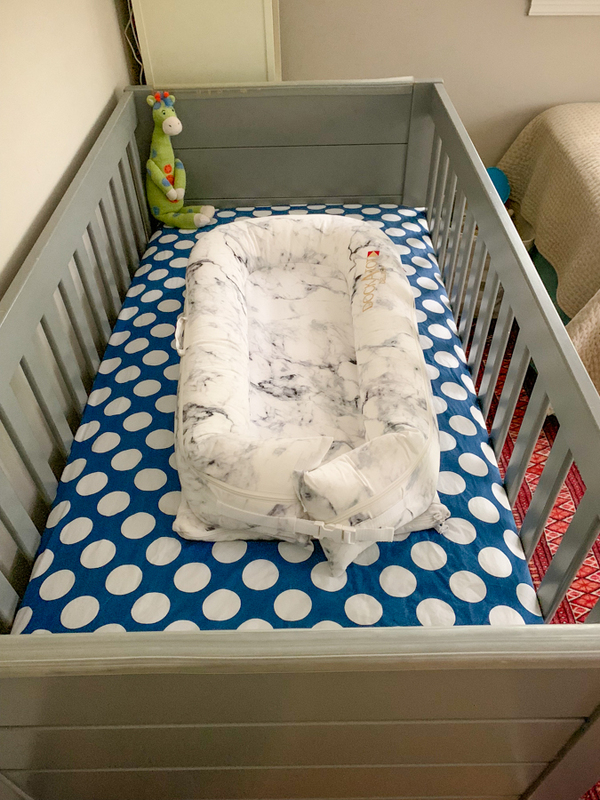 We may use it for naps – we just aren’t sure yet! 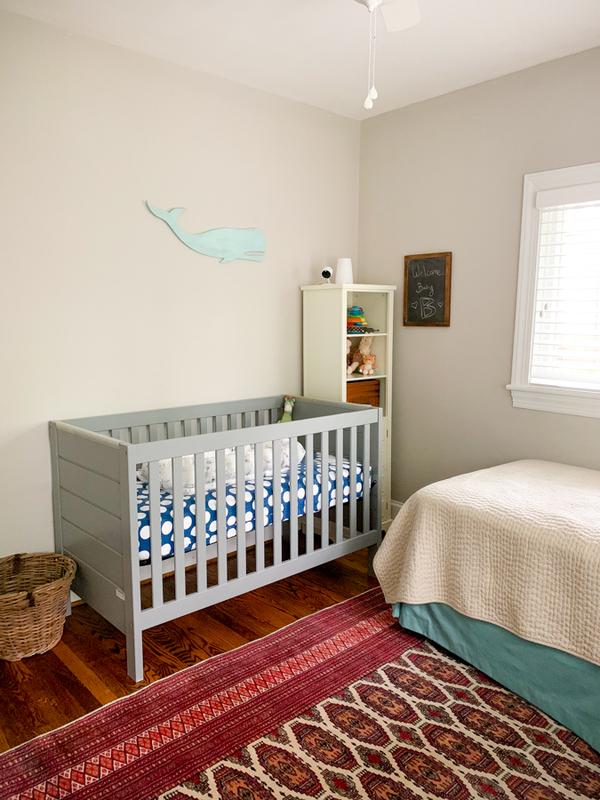 The nursery is more practical than Pinterestable. 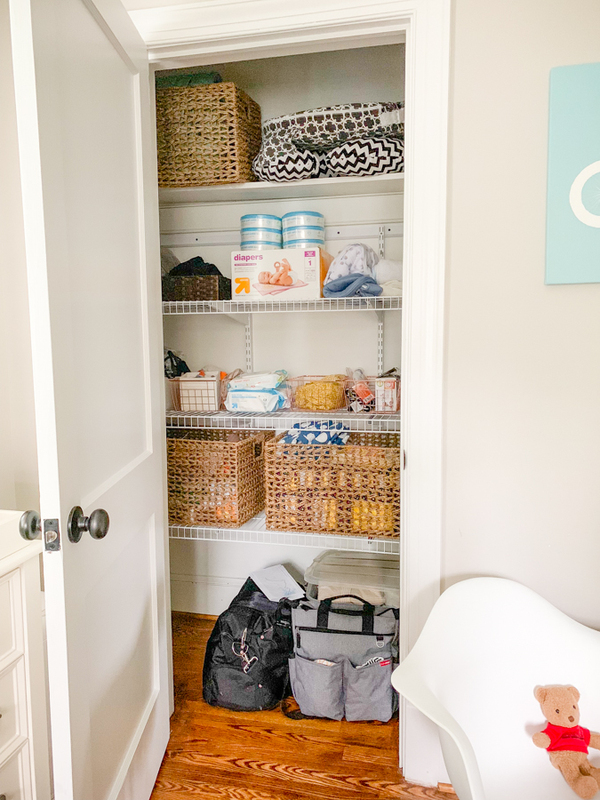 While I would have loved to start from scratch selecting all new things for a perfectly decorated nursery, I am way too practical for that. 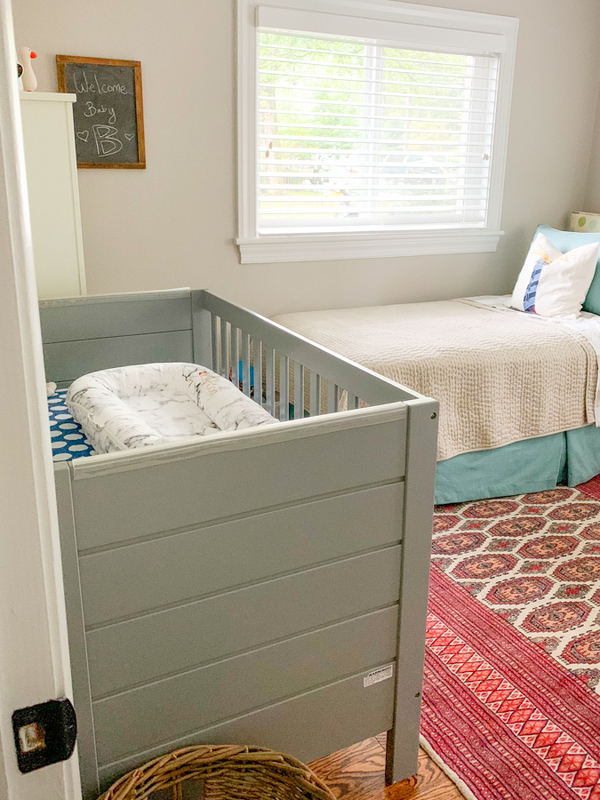 The crib is Mazen’s, and the rug is Thomas’s that he loves, so we didn’t want to get rid of it in favor of a super-cool nursery friendly rug. I’m also skipping curtains (for now) because I just want to be done with it. We could use a bit more artwork on the walls but that can wait as well. My mom is painting the baby something special! So basically the nursery is not photo worthy, but this is as good as it’s gonna get for now. The bed makes it crowded – I know. We already owned this twin bed, so this will be his big -boy bed eventually. 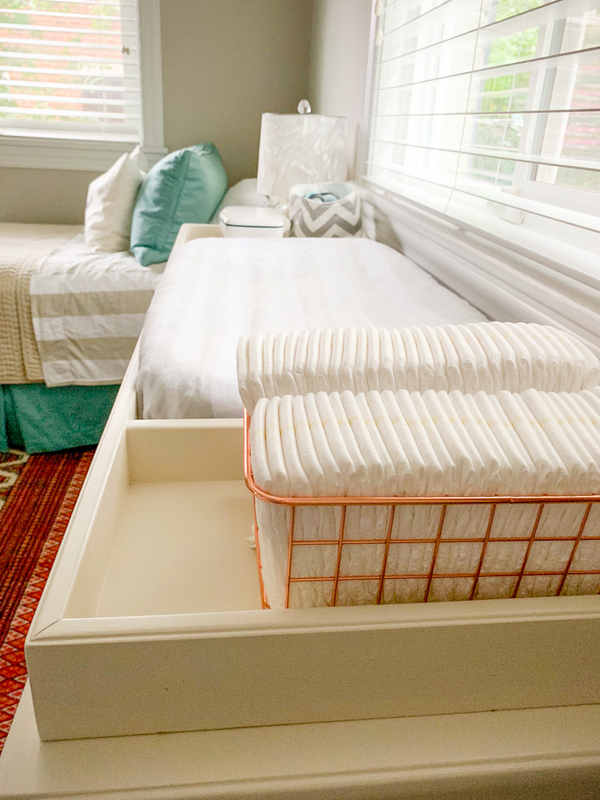 I know the whole glider v. bed debate is a hot topic, but I did a lot of lying-down nursing last time, and I love having a bed for outfit changes, stories, and occasionally sleeping in the nursery if the little guy is sick. It’s also an extra guest room for us. The bed makes it feel a bit crowded though – I know! Had we not already owned it, I might have just gotten a glider that would have fit the space a lot better. But: practical. But it’s still a nice, cozy space for a little boy! To the left you’ll find Mazen’s old crib. In the corner there is a cream-colored storage piece that has followed me from our Charlotte days. It was actually one of my first blog reviews from JC Penney! I have almost given it away 10 times but it’s so practical that it keeps following me. A year ago it was filled with beer glasses and covered in beer and dust. But I realized it would be perfect for this corner to store baby books, toys, a monitor, and extra bedding. On top of it you’ll find our Hatch White Noise Machine + Night Light (a splurge – love that it’s app controlled!) and an Amazon Cloud Cam that we got bundled with an Echo Spot for my night stand that we may or may not use as a primary baby monitor. We bought the bundle for a number of reasons, mostly because it killed many birds with one stone. I’m not sure if once the baby is sleeping in here if we will use this in addition to a classic monitor (that has been in Mazen’s room for ages) or if this will be the only monitor. That’s another “cross that bridge when we get there.” Thomas loves it because he can check the app from work and see the baby nap and play, so the app access definitely influenced our decision to purchase it since our regular monitor (the Motorola MPB36) is not WiFi or app connected at all. 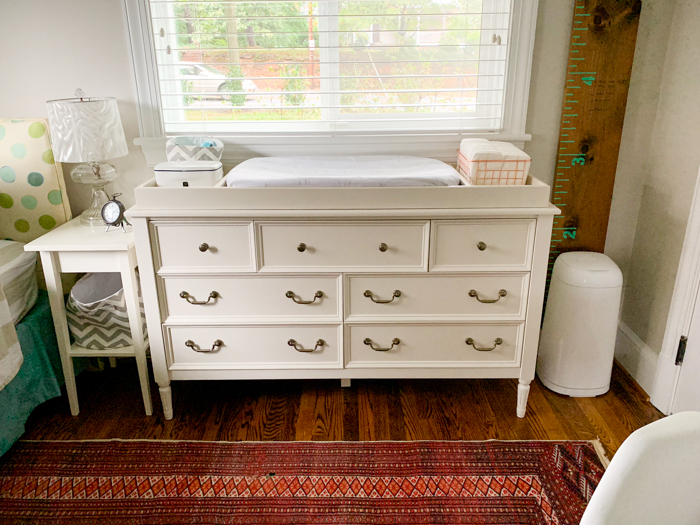 Zooming around to the other wall, I really love the Blythe Pottery Barn Dresser + Changing Topper I bought a few years ago! 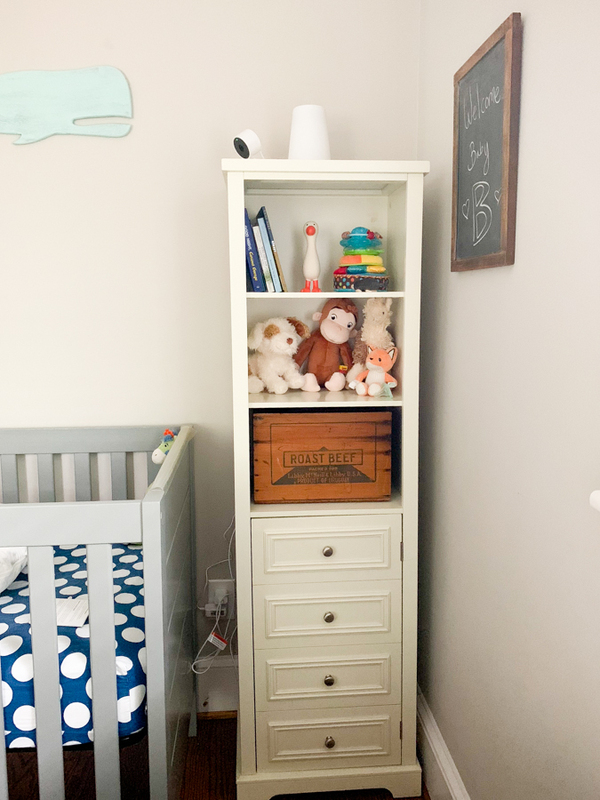 It’s the most expensive “baby thing” I’ve purchased, but I got it during a PBK sale, and it’s been used through the years for office storage and will be used for Baby B’s clothes in the years to come. I love the changing topper (it’s removable!). 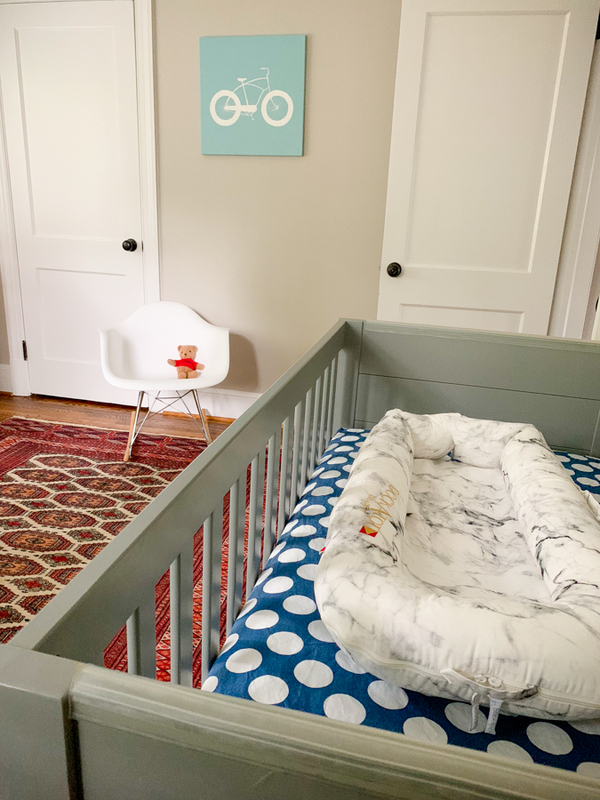 In Mazen’s nursery we just had a pad on a dresser secured to the wall, so it will be cool to have an actual changing zone this time. Changing pad from Target : ) And I found the rose gold baskets at Walmart randomly a while back and had to have them! (They are insanely cheap.) The lamp was my grandmother’s, and the night stand (which barely fits!) is IKEA. The growth chart ruler is staying put, and it’s locally made by Buffalo Gals! Here is the final wall, including the bike painting I DIYed for Mazen’s nursery. And this is the modern rocking chair! I LOVE having shelves in the closet! We have so much storage potential in here. A lot of this will actually be out soon – the nursing pillows, the hospital bags, the extra clothing on the floor. Lots of room for storage and toys! That’s a wrap, my friends! I hope we will bringing baby home to his room soon. 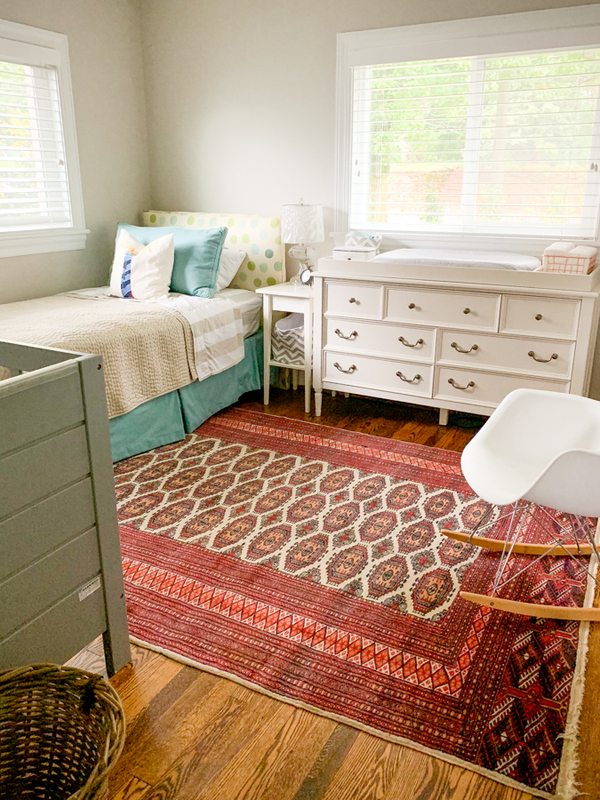 The post Baby B’s Nursery! appeared first on Kath Eats Real Food.